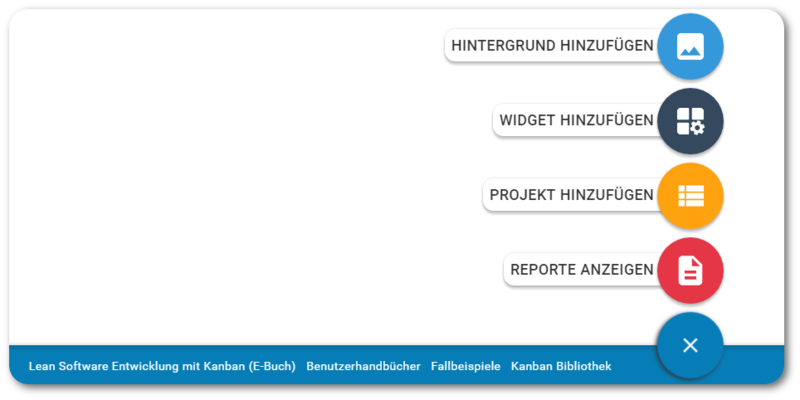 Product Update 5.5 allows German-speaking users of Kanbanize to make the most of the platform in their native language. Choose your preferred language option in the Account Settings menu in the top right corner of any dashboard. Click on your username, then select “My Account”. A new dropdown field has been added at the bottom of the window. It contains the currently available interface languages. Make your choice, click “Save” and the changes will be implemented to your account instantaneously. This is the first of many interface language options. We are eager to hear suggestions about which language we should focus on next and we are looking for volunteers to translate for the languages in which they are proficient. The full German internationalization process will be completed over the course of the following weeks. We welcome any volunteers who wish to help us speed through the challenge! Thank you for your patience! 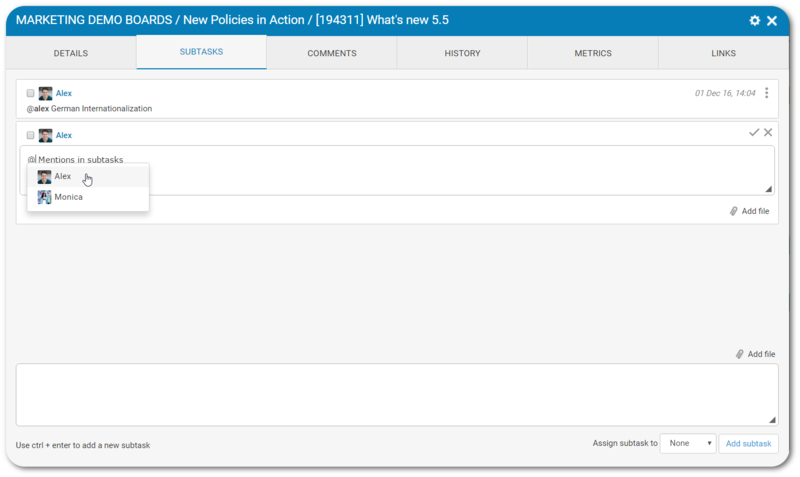 Version 5.5 of Kanbanize allows users to be mentioned directly from card subtasks. Users can be mentioned in both new and existing subtasks. From the subtasks tab, just type in “@” and an auto complete list of the users in the account will appear. Mentioning a user in a subtask will automatically assign the subtask to them. 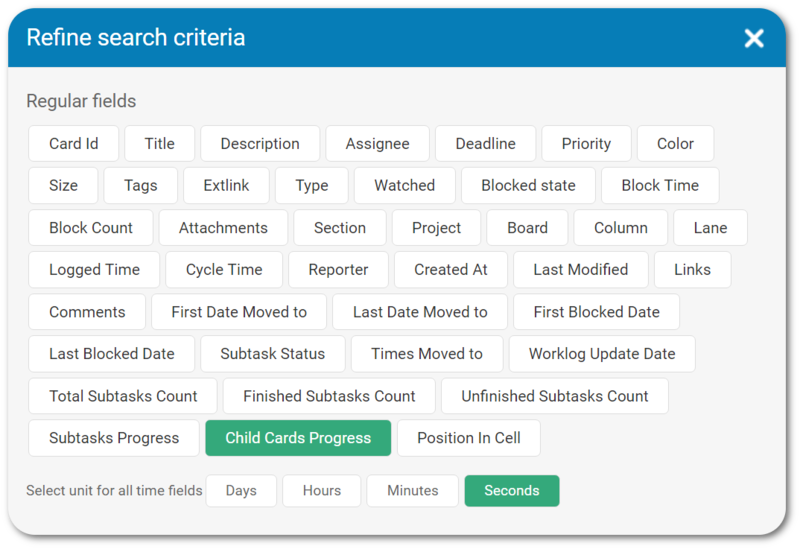 Mentioning users in subtasks is possible using the Subtasks tab in every card and also during quick subtask creation when the card is closed on the board. Note: Mentions made during quick subtask creation will not generate an auto-complete list of users in the account, the username should be typed out in full. 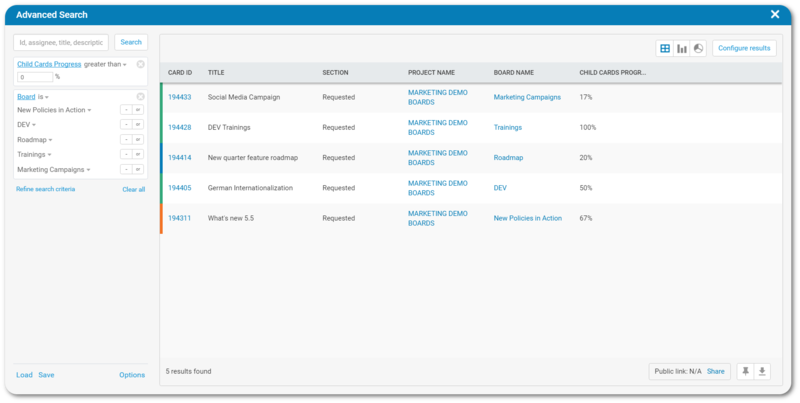 Product Update 5.5 allows users to easily monitor the progress of larger assignments that are broken down into multiple cards and linked to a single parent card. For this purpose, a new criterion called “Child Cards Progress” has been added to the advanced search. Refining your search using the progress status of children cards (in %) will generate an advanced search of all parent cards, the children of which correspond to your defined % of completion. This feature is indispensable for tracking the progress of larger portfolio parent cards with various linked tasks throughout the account. 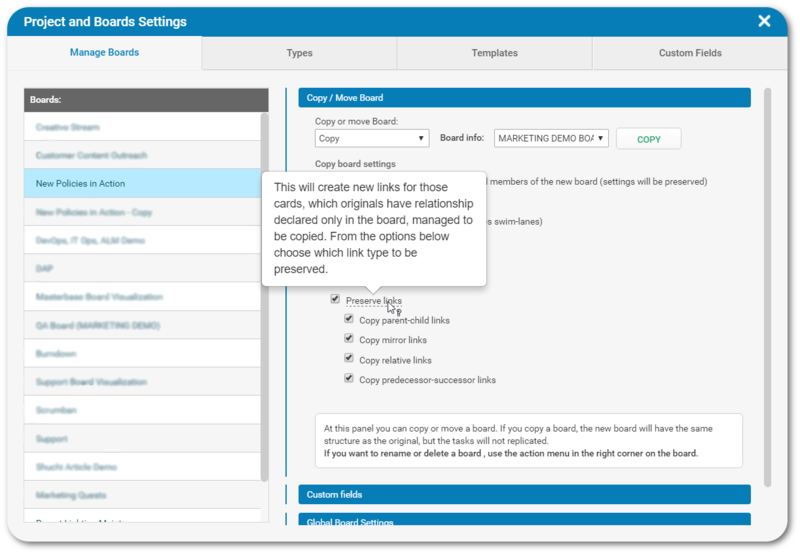 When copying a board from the Manage Boards tab of the Project and Boards Settings, you can choose to also copy the internal links between the cards within it. Select the new checkbox “Preserve links” in the Manage Board tab and choose which types of links you wish to also transfer to the copy. Finally, copy your desired board to the selected location. Note: Links will be copied only if they are between cards on the same board. 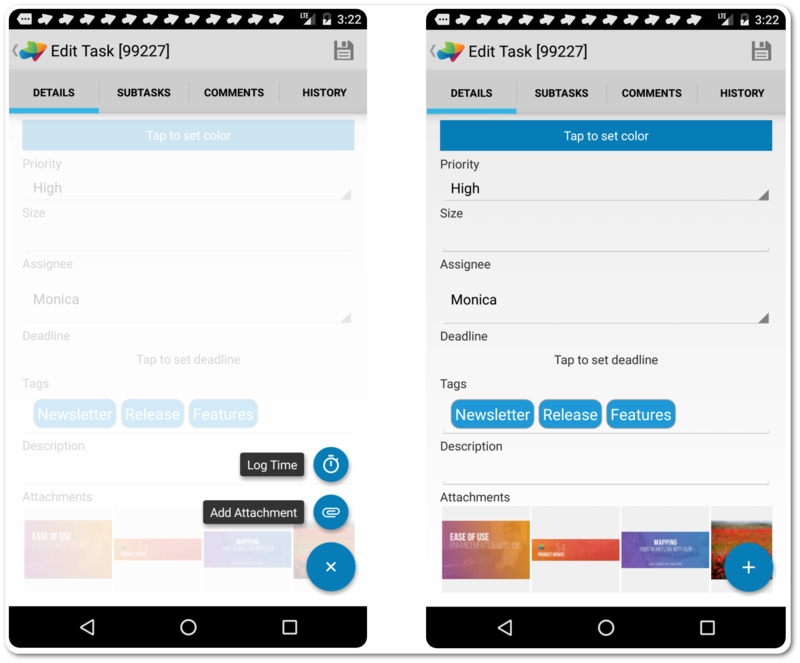 Attach images to Kanban cards in the Kanbanize Android app. Select a card in one of your project boards and open it with the app on your mobile device. An “Additions” button has been added at the bottom right corner of your screen. Clicking on it allows you to add attachments to the card. You can either take a photo or choose an existing image from your camera roll to upload. As soon as the process is completed, you will notice that there is a new slider at the bottom of each of your cards showcasing existing attachments. Tap on the thumbnail attachment images in the slider to view in full detail. From there, you can download the attachment to your camera roll or share with other apps at will. Note: The “Additions” button provides you with an additional way of logging time in the card through mobile as well. Logarithmic calculation of the “y axis” provides you with more accurate visualization in the Cumulative Flow diagram. In addition, this new analytics enhancement visualizes the flow more clearly when there is an existing streamline with a far greater amount of cards (e.g. Permanent Archive). To apply logarithmic calculation click on the new checkbox that has been added to the configuration panel. The logarithmic calculation can be applied in the “Flows” tab of the Kanbanize analytics as well.